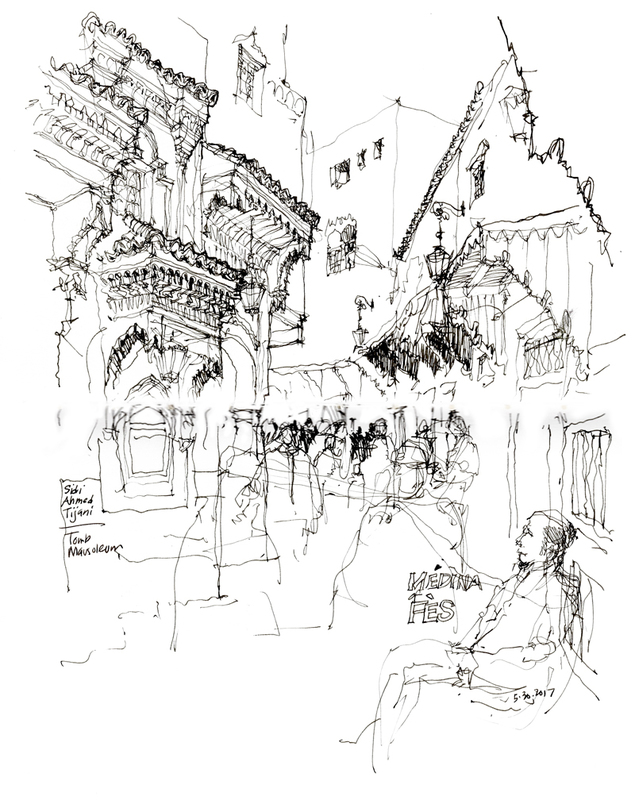 The Médina of Fès is one of the largest car-free urban zones in the world and through its pathways people and goods flow like the blood coursing through our arteries and veins. Because of their narrowness, it seems awkward to call these pathways “streets” although that is how they function. In addition to serving as paths for people and conduits for goods carried by handcart or donkey, these “streets” serve as informal social spaces and as extensions of small commercial establishments. 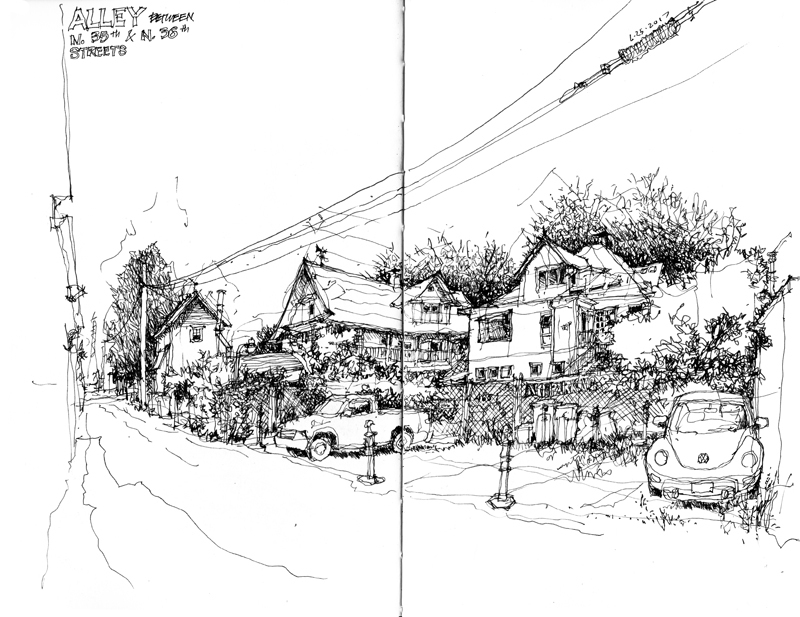 There are generally three scales, ranging from main streets as seen in the first image above, to side streets, and finally to back streets as narrow as a meter wide as seen in the images below. 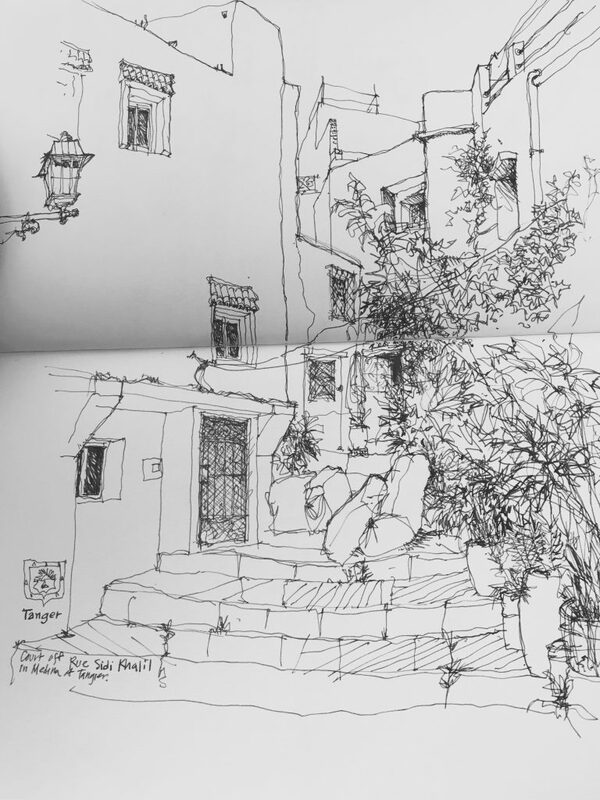 This post is not about drawing. 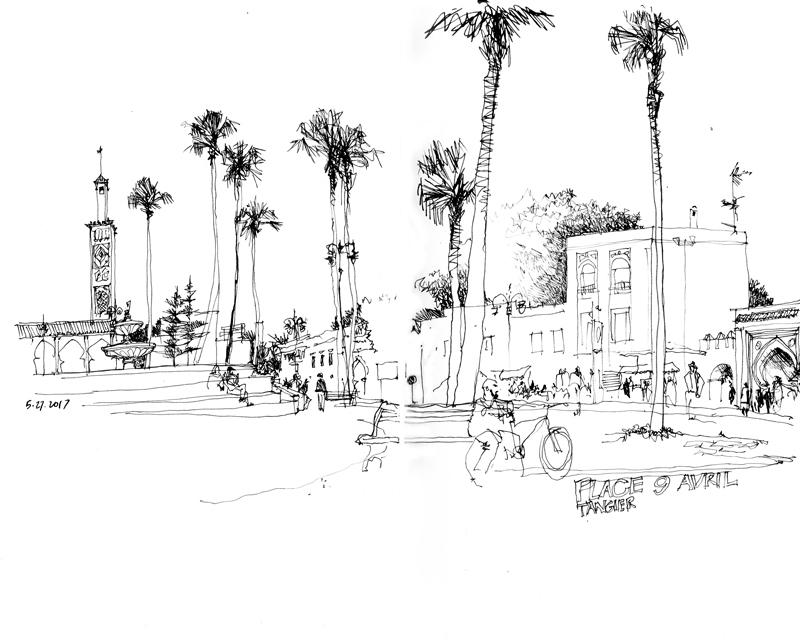 Rather, it concerns the issue of scale—the relative sizes of things and how we perceive this comparison—which is relevant to both drawing and design. 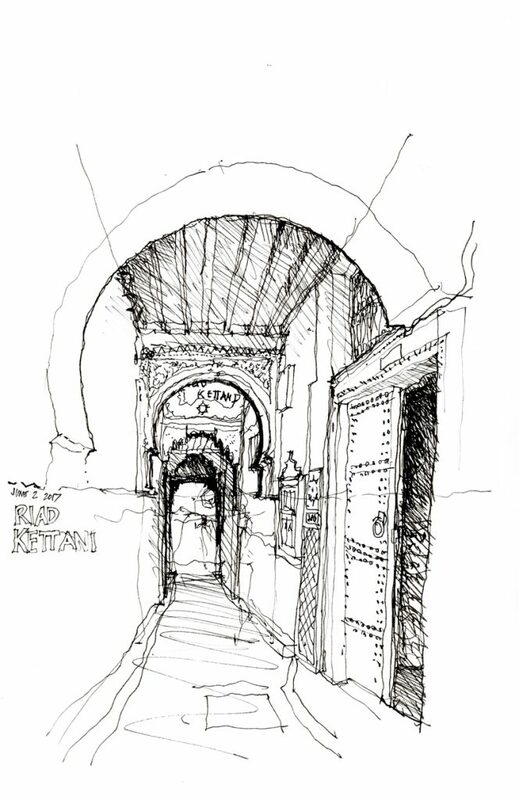 The historic core of the Médina of Fès, Fes el Bali, was founded in the late 9th century as the capital of the Idrisid Dynasty. The médina is full of souks and artisans working in leather, copper, brass, wood, textiles, and ceramics, and is home to historic mosques, mausoleums, and madrasas, as well as Al-Karaouine, founded in 859 and considered to be the oldest continuously operating university in the world. Markets line its car-free streets and sell all manner of herbs, spices, fruits, and vegetables. Declared a UNESCO World Heritage Site in 1981, the Médina of Fès remains to this day a medieval town in layout and scale, with a dense, low-rise building fabric, and narrow streets. Returning home to Seattle from Fès, I find it difficult to convey the differences in scale and density of the two urban environments. 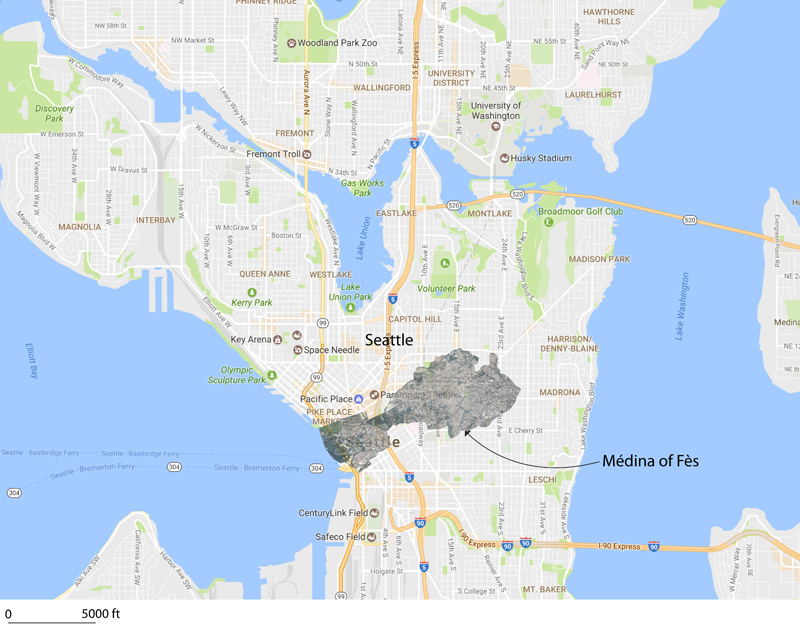 Above, I overlaid (I hope accurately) the plan of the Médina of Fès atop a map of a portion of Seattle to indicate their relative sizes. What cannot be seen, however, are the relative population densities of the two urban areas. That of Seattle is around 6,800/square mile while that of the Médina is roughy 70,000/square mile. Even if my calculations are off by a little, that is a significant difference in scale that is difficult to understand without actually experiencing it. 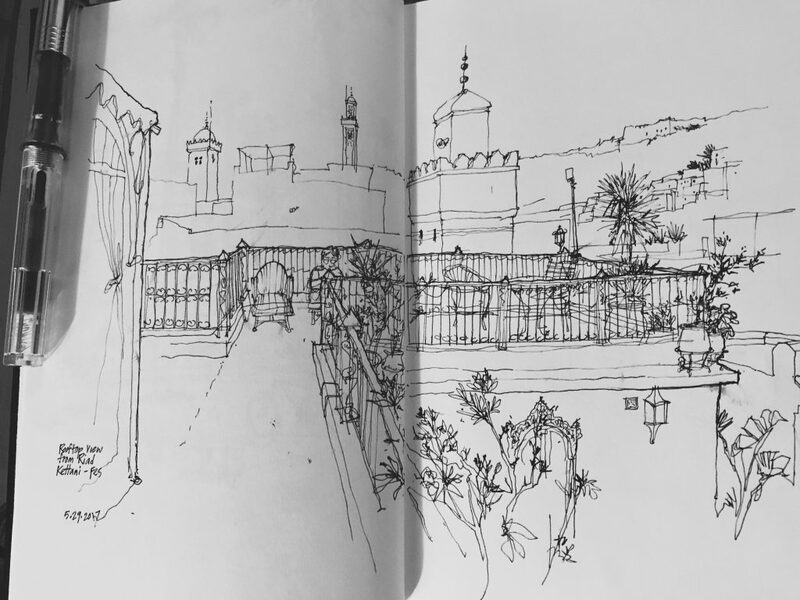 Sharing a couple of views of Morocco. The first is a small court in the médina of Tangier. The second is a view from the rooftop of Riad Kettani, where we are staying in the médina of Fès. 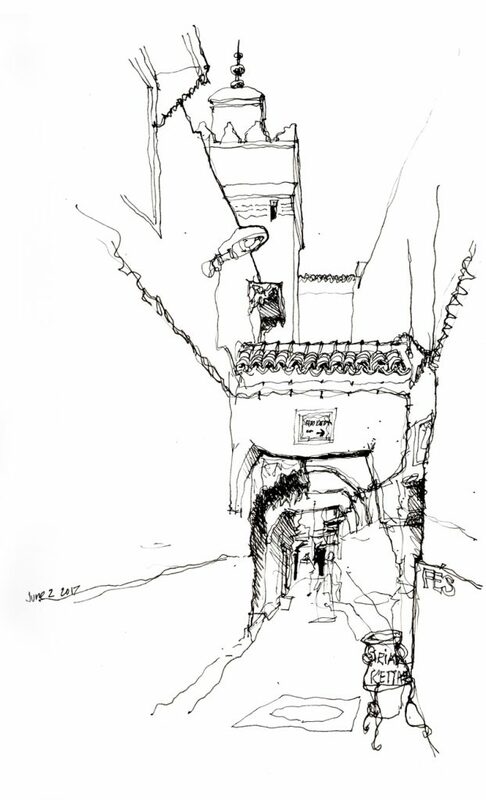 Entering médinas, especially the one in Fès, is like walking into new worlds.